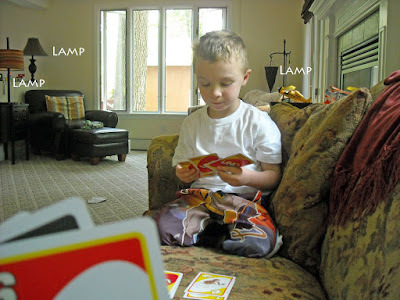 Today's tip: Keep cards simple by using straight cuts.....keep the Cuttlebug and Nestibilities in the draw! This card took me literally minutes to make! Once I chose a patterned paper for the background it was a simple task of cutting and layering my cardstock. My Odd Bird Planet images were stamped on Stampin' Up! Saraha Sand cardstock vs. white. And how about that sentiment? 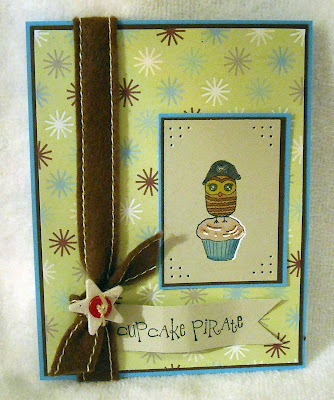 Cracks me up every time...an owl dressed as a pirate on a cupcake...Fabulous! 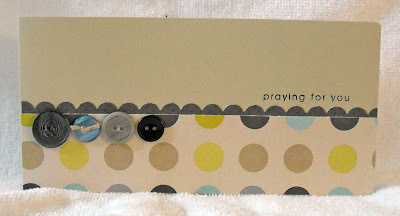 A quick piece of ribbon, chipboard star, and tiny button finished up the card. I should also mention that this layout is based on the OBP June sketch, found in the monthly newsletter. Enjoy! This is a first for me, participating in the CardPatterns sketch challenge! I adore sketch challenges because...well...someone has already done the hard part. ;-) This was a special week at CardPatterns because this week's sketch was sponsored by Odd Bird Planet! It's been far too long since I inked up my OBP stamps and I had a great time this evening creating not one but two cards to share this weekend! This card features one of my favorite floral images, Flora Hugabundous, from OBP paired with a dainty "thanks" sentiment. Be sure to check out all the beautiful creations over at CardPatterns...if you enter a card, must do so by midnight tonight, you'll be entered into a drawing for a Fairytale Limited Edition Kit! This week it was Melita's turn to set the challenge for the SALT team and she choose The Fruits of the Spirit as outlined in Galatians 5:22. Melita provided us with a wonderful write up on this topic, along with scripture verses for each "fruit." Do take the time to head over to the SALT blog to read about her challenge! "But the fruit of the Spirit is love, joy, peace, longsuffering, kindness, goodness, faithfulness, gentleness, self-control." -Galatians 5:22 In his letter to the Galatians, Paul uses the metaphor of fruit to describe the conduct of believers (the conduct of the unbelievers is outlined in Galatians 5:19-21). When I ponder whether or not I consistently see these fruits in my own life, I feel somewhat discouraged. There is no doubt that I need to be more loving, longsuffering, kind, etc. and so many times I see the opposite in my life. Sometimes our perceived lack of progress in one or more areas can cause use to feel a sense of despair. However, I think that sense of hopelessness is a lack of faith, and usually a lack of prayer, in the One who is able to produce genuine change in our lives. I have found that God has used some of the most trying and frustrating times in my life to produce better fruit. I read through Matthew Henry's comments on these verses in Galatians, he writes: "By describing the works of the flesh and fruits of the Spirit, we are told what to avoid and oppose, and what we are to cherish and cultivate; and this is the sincere care and endeavour of all real Christians. Sin does not now reign in their mortal bodies, so that they obey it, Romans 6:12, for they seek to destroy it. Christ never will own those who yield themselves up to be the servants of sin. And it is not enough that we cease to do evil, but we must learn to do well. Our conversation will always be answerable to the principle which guides and governs us, Romans 8:5. We must set ourselves in earnest to mortify the deeds of the body, and to walk in newness of life. Not being desirous of vain-glory, or unduly wishing for the esteem and applause of men, not provoking or envying one another, but seeking to bring forth more abundantly those good fruits, which are, through Jesus Christ, to the praise and glory of God." Those who love Christ will never perform perfectly, we will continue to fail in many areas and may struggle to see fruit. But do not lose hope! God will be faithful to His Word. If He calls us to be loving, then by the power of the Holy Spirit and our exercising love, we will become more loving individuals. What a comfort to know that we don't have to try and attain such lofty goals on our own; we need only to rest in Christ. With today's card I was channeling Michelle Zindorf. :-) Anytime I think of using trees, I think of Michelle! She has wonderful tutorials posted on her blog and following her simple instructions produces great results. Her cards are like little pieces of art! 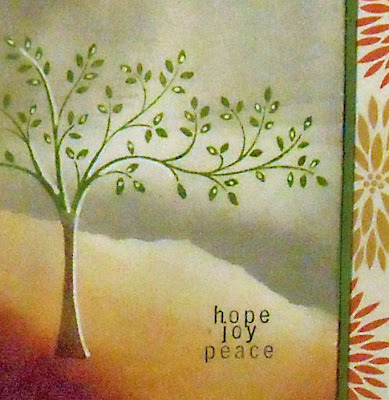 I posted a close up shot of the tree, and sentiment (my thoughts on the results of the Spirit-filled life!) so you can see the highlighting, from a white gel pen, on the tree. Michelle uses this technique frequently, this is a first for me, and I love the results, especially the tiny highlights on the tree leaves. All supplies used on my card are from Stampin' Up! Please stop by the SALT blog to see the beautiful work the design team has created to share with you this week! 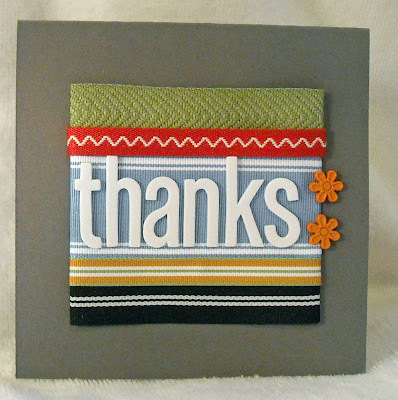 Today's tip: Use ribbon instead of patterned paper to create a super quick and easy card! I did it, I did it! I managed to not only create but also post a Keep it Simple card...and even on time! It's a miracle! LOL! I've been having a hard time getting comfortable in my new stamping studio, which is wonderful, but I'm missing all my great storage that I had in the old place so quickly finding what I need is time consuming. I'm looking forward to creating a more organized space soon...Anyone have any tips for great storage solutions for small spaces? :-) I confess that the idea for this card came from a CARDS magazine from a few years ago but I thought the ribbon idea was brilliant! The card base is 5" x 5"...I then cut a 2.5" x 3.5" piece of cardstock and layered different ribbon around the card, securing the edges behind the cardstock. All of these ribbons were from a Stampin' Up! pack, that included all five designs. The ribbon covered square was attached to the cardbase and I then used American Crafts foam letters to spell out thanks. A few SU! flower brads added just a hint of color. Time to finish card? 10 minutes! 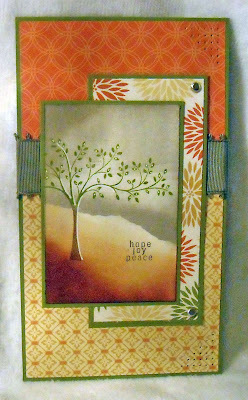 Enjoy today's card and be sure to head over the the Stamping Around blog...Deadline to register for the CT event is this Tuesday! OK, I admit defeat...My Keep it Simple Sunday post is well...just not going to happen this week! I made a card, took a picture, and when I downloaded the photo it just didn't look that great and I still haven't had time to take a second picture. Some weeks just get away from you... However, I do want to share a card I made a few weeks ago using my favorite new stamps from Unity! Wow! I just adore their images and a few months ago signed up for their Kit of the Month club. Each month, for just $24, you get a boatload of stamps shipped right to your door! The images from this card are from the May kit. (I think you can purchase retired kits for a reduced price too...Check their site for details) The papers used on the card are from Stampin' Up! and the rhinestones are from Taylored Expressions. For the card, I stamped the butterfly image on a piece of patterened paper, then cut it out to attach with dimensional tape. I cut off the stamped antennae and added wire ones. The "trail" behind the butterfly is actually a branch but upside down I thought it looked more like a trail! :-) Trail was colored with Copics! Enjoy and I'll do my best to get my act together for next week...LOL! I know, I know...I owe you a Keep it Simple card and really, I have something to share but first I must share the details of a bunch of huge sales going on over at Odd Bird Planet! First, it's Odd Bird Planet's THIRD Birthday and you're invited to the party! Everything in the store is 30% off from now until June 20! Where: Odd Bird Planet Secret Password: bday3 <--This coupon code must be entered during the checkout process. Second, in honor of Father's Day, OBP will be running a Father's Day Sale, starting now and running through June 22nd! Visit Johanna's blog for a list of stamps and details on the sale! But guess what? You'll receive the 30% off of the sale price (instead of 25%) for The Father's Day Sale items and clearance stamps!!! And those darling stamps pictured above? They are part of the June Special, a group of stamps that are packaged together and sold with a cost savings of 30% off! I hope you come celebrate with us and enjoy these amazing cost savings! 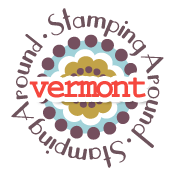 Registration for our Vermont event is open! Check out all of the details on the temporary Stamping Around site, here! 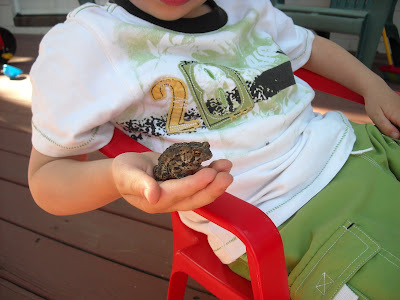 We're all (well, the adults) are a bit under the weather so I hope to be back tomorrow with a fun Keep it Simple post! This week it was Lythan's turn to issue the SALT challenge and she chose "Community of Faith." You can read her write up on the SALT blog. First, what a wonderful challenge! It's been delightful to think about my beloved friends from our close knit church for the past two weeks. We have been blessed to be members of a Reformed Baptist church for the past 10 years and the following verse came to mind when Lythan announced this week's challenge: "For where two or three are gathered together in my Name, I am there in the midst of them." Matthew 18:20 This week, the topic was especially dear to my heart. As many of your know, we recently moved and the backyard of our old house overlooked the parking lot of our church. Our Pastor's house was also clearly seen from our back porch. We are close friends with our Pastor and his family and I am especially close to his wife. When we were showing our house, some prospective buyers commented that they wouldn't want to sit on their porch and look at a church or the parking lot of a church and yet that has always been a precious sight to me. Being so close to church allowed our family to be an extension of the church, to be more intimately involved in the ministry at church, and to be a help to our Pastor and his family and them, an even greater help, to our family. Over the past five years, we've enjoyed many meals together, talks at our fence and many, many phone calls, hours of stamping, a whole lot of babysitting help, assistance with late night runs to the emergency room (for kids and a dog), housing in an ice storm, sharing missing recipe ingredients, and lots of emotional and spiritual support. One of the hardest things about moving was leaving our Pastor's wife, my friend, who has become like a sister to me. I know she's not that far away now but living so physically close was an extra special blessing and not only further deepened our friendship but gave us a true experience of being a part of a community of faith. It seems that there is a uniquely special bond that God gives to those who have all experienced the changing power of God's grace. My family is rather scattered; living in different states, etc. and it's been an incredible blessing to have my church family not only close but also always ready to lend a helping hand, to offer support, to listen and advice, and to pray with. I will be forever grateful that God lead our family to such an amazing church and provided us with the unique opportunity, if only for a short season, to live so close to not only our church home but also to our dear friends. If you haven't guessed, my card is geared towards my friend (isn't that a cute stamp!) as I feel that we really are kindred spirits and she was the first person I thought of for our challenge! We have very similar personalities and it seems that God uses each of us, at different times, to encourage the other when needed....perhaps having a greater understanding of our challenges since we tend to react in a similar way to life's circumstances. It's a good thing our down times don't happen at the same time! LOL! Love you girlfriend and I miss you!! :-) I'm using all Stampin' Up! products on my card, with the exception of the darling main image, which is from Unity Stamps (my new favorite stamp manufacturer!!) Enjoy! Make sure that your three-year old is sweetly tucked in his bed, sound asleep in the midst of his normal two and a half hour nap. 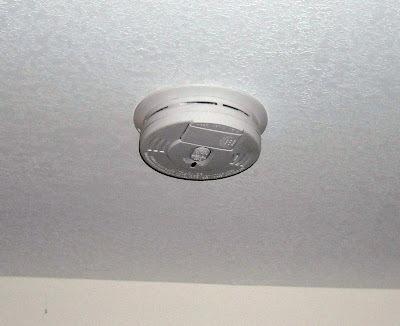 Upon returning to the kitchen, open the oven door really wide when you see the smoke...because it makes more sense to let out a huge billow of smoke instead of simply turning off the oven when you see a few wisps. Registration for Connecticut Event is Open! I'm not sure I've shared this here or not but following on the success of Stamp NE, my dear friend Julie Masse and I decided to start a company, Stamping Around (our new web site will be live soon). Our company goal is to provide crafters with an opportunity to spend time creating with their friends, while getting to know more about how to use their favorite products and/or techniques from industry experts. We have three events scheduled for the remainder of 2009; Connecticut in July, Vermont in September, and Philadelphia in November. We just opened registration for Connecticut and we're holding the event in a beautiful suite-only Inn - I can't wait! :-) Click on the "Stamping Around Conn" badge on the left hand side of my blog for more details! And feel free to drop me an email (ksdm@comcast.net) or comment if you'd ever like to teach at any of our events or if you'd like to attend! 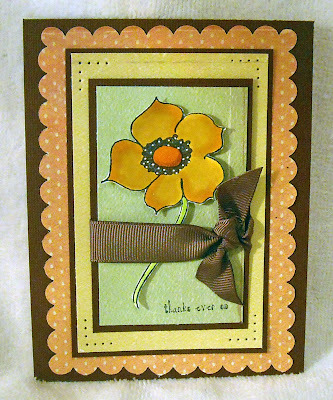 Tip: Use a pre-made card base and minimal embellishments for a quick and easy card! 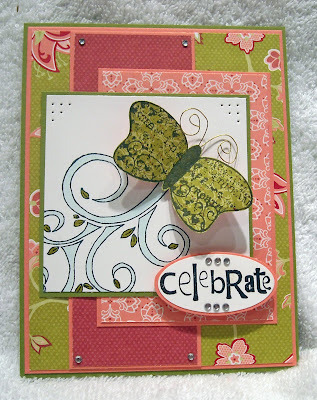 Today, my was created using a 4" x 7" pre-made card from Stampin' Up! (These cards also include envelopes). I simply added a strip of scalloped paper and patterned paper to the bottom of the card base, a few buttons (only adding thread to one of them), and a simple sentiment to complete this card. Easy peasy! Why another praying for you card? I shared awhile ago, here, about a couple that we visit whenever we're in NY. They just received news that their brother (and BIL) is very ill with a brain tumor. He's newly married and has a child on the way so it's a heart breaking situation. We're hopeful that our many prayers will be answered and God, through excellent medical treatment (or without), might be pleased to grant him healing and a very long life. I'll be sending along this card to let them know that their family will be in our thoughts and prayers. Wishing you a blessed Sunday! A few weeks ago I unfortunately had to attend a wake for one of my friend's husbands, after he lost his long battle with cancer. It was such a sad time...They had been married for 36 years and were obviously still crazy in love with each other. It seems odd to consider one without the other. I always feel unsure about what to say to someone who is suffering such a loss and typically think there's not much I really can say that will offer much comfort, except to say that I'll be praying for them. 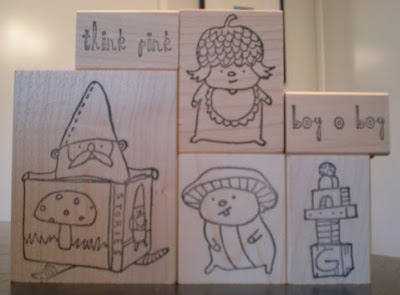 This set from Stampin' Up! was perfect for my sympathy card. 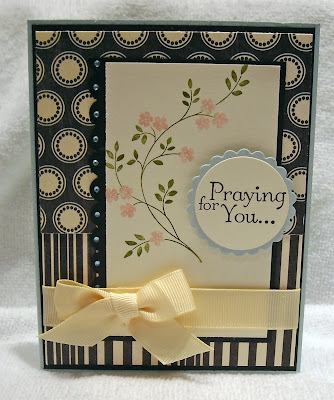 Not only does it include a "praying for you" sentiment but it also includes wonderful words for inside the card. It also includes a beautiful tree and this floral image. My friend is a huge gardener (you should see her beautiful yard...I love it!) and knew she'd enjoy something with flowers. The image is paired with my fav black and cream Crate paper. Ribbon is also from SU! and tiny rhinestones are from Taylored Expressions. Have a blessed day! One more graduation card that is! This is my last post with a graduation theme...I know that probably makes you happy! hee hee Wondering why I have so many grad cards? There is a new publication hitting the market, Christian Paper Crafts (I believe their first edition will be out in July or August) and I have a few cards being published. The editor asked me to send a few grad cards but due to a push back on their release date couldn't use them since it would be past June. So now you're being blessed with an over abundance of graduation cards posts! 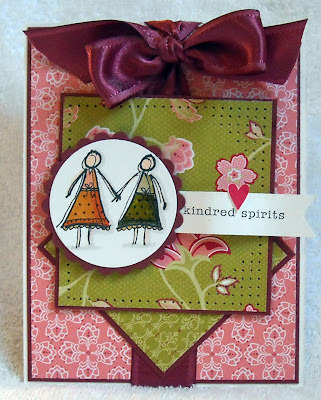 :-) This card combines two of my favorite crafting items...Papertreyink stamps and Crate paper! (There's a few SU! stamps in there as well!) The paper is part of a little boy themed pack from Crate. Funny this is, I don't think I've ever used this paper to make a little boy card...I'll have to work on that! 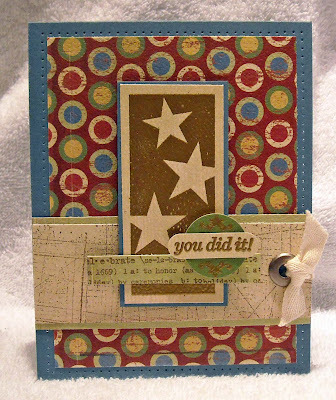 The star and "you did it" images are from PTI and the two background images are from Stampin' Up! Enjoy and I promise my next post will not feature a graduation theme!